This bronze plaque was created by Kathleen Robinson Ingels (1882-1958). Its dimensions are 6'9" x 4'10". Edmund Janes James gifted this piece in 1917. It is located in the foyer of Foellinger Auditorium. 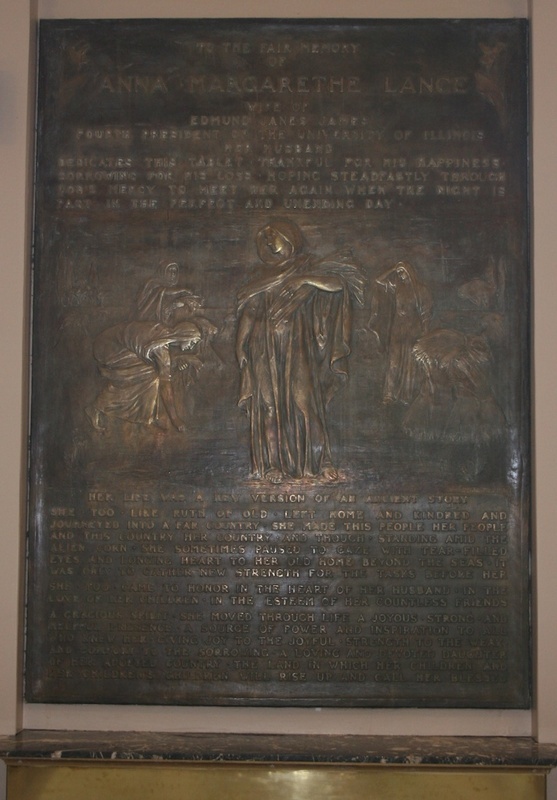 In 1917 President Edmund Janes James commissioned and presented this nearly seven-foot-high bronze plaque to the university as a memorial to his wife, Anna Margarethe Lange, who had died three years earlier. The gifted sculptor Kathleen Robinson Ingels, a member of Lorado Taft's Chicago MidwaY. studio group, created it. Taft told James that he considered it "one of the best things that have gone out from these studios. The beautiful idea was yours[,] and Mrs. Ingels has given it worthy embodiment. Her composition is lovely and most sympathetic and the execution leaves nothing to be desired. I congratulate all concerned, including the University, for these are the things which enrich the background of college life." Aware that the artist might not be accorded sufficient recognition in public announcements, he went on to emphasize, "It is her work and not mine." While made to commemorate Mrs. James's warm, enlightened, devoted service to family, faculty, and students, the sculpture was also in recognition, the president explained, "that women who have no official connection with the University, except through the fact that their husbands are members of the staff, may form a very real source of strength and power in the accomplishment of those ends for which the University exists." Others described her as "a grandmother to all faculty babies" and "an earnest advocate of women's suffrage." James saw certain parallels between the biblical Ruth and his German-born wife, and the tablet depicts, in flattened-out, very shallow relief, hazy, almost incorporeal, idealized figures of Ruth and other women gleaning in the barley fields. Ruth gazes back toward her homeland. The touching inscription says, in part, that "her life was a new version of an ancient story. She, too, like Ruth of old, left home and kindred and journeyed into a far country. She made this people her people and this country her country, and though, standing amid the alien corn, she sometimes paused to gaze with tear-filled eyes and longing heart to her old home beyond the seas, it was only to gather new strength for the tasks before her.... A gracious spirit, she moved through life a joyous, strong, and helpful presence; a source of power and inspiration to all who knew her, giving joy to the joyful, strength to the weak, and comfort to the sorrowing; a loving and devoted daughter of her adopted country, the land in which her children and her children's children will rise up and call her blessed." Ingels exhibited at the Art Institute of Chicago between 1909 and 1917 and received awards from the Art Institute and the Los Angeles Museum. Her sculpture 'Inspiration', a marble group designed as a memorial to the artist Florence Adams, was a gift of her pupils to the Art Institute and has been in its collection since 1915. Muriel Scheinman, “To the Fair Memory of Anna Margarethe Lange, Wife of Edmund Janes James, 1917,” ExploreCU, accessed April 21, 2019, https://explorecu.org/items/show/15.